This website originates from 1999, when it only featured the WD/CO/B (Coby). This webpage can now be viewed as a WD/CO special. 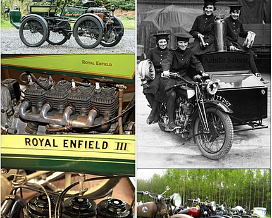 Since then the site has been largely extended, but all sections show pictures about or around Royal Enfield Motorcycles. The website/album was made with JAlbum using a personalized Turtle skin. I added two optional files to be included in the album, one before and one after the thumbnails. In these .inc files some personal features were added and in some cases different html content like google maps and youtube movies. The website is hosted on a 10Gb JAlbum webspace. This starter 'album' is the beginning of the website, which allows me to quickly switch hosts in case of an emergency and to start different websites/albums at different locations. I added the Brough Motorcycles album because of the most interesting motorcycles I viewed while visiting the REOC Rally in Linconshire in 2009. The Broughs were then exhibited in the Wallington Hall Industrial Museum of Nottingham. The first Royal Enfield motorcycles were made in 1898 in a small factory in Redditch, Worcestorshire, England, where production continued until closure at the end of the 1970's, when a lot of British motorcycle factories were closed. The Royal Enfield factory has little in common with the famous Enfield gun but for its name. The name Royal Enfield came from the Royal Small Arms factory in Enfield near London, which was a big client for their precision parts for guns etc. The Enfield mark came on the first bicycles and motorbicycles the factory made in the 1890's. The Royal was added later. The slogan of the new make was appropriate 'Made like a gun' which was their trademark until closure. Over the years a lot of models from very small to the biggest British motorcycles of their time passed the way to the customers. Although the Royal Enfield factory was not a very large one, it left its mark by continuous innovation and efficient use of parts on different models. During the 1920's and 30's RE was famous for their big V-twins, which were used during the 1st world war by different millitary among which the Russian. The capacity of the v-twins grew from 425cc (the model 140) in the beginning of the 20th century to 1140cc, the model KX, in the late 1930's, which was the largest v-twin available at that time. Also their 225cc twostroke was a famous cheap and reliable every day bike which lasted in some form until WWII. During the 2nd world war Royal Enfield participated with a few models, which were nothing less than updated prewar models, like the 350cc SV model C, the 350cc OHV model CO (though updated), the big single SV 570cc model L and the small 250cc SV model D which all got a prefix WD/ (War Department). Famous is the 'Flying Flea' a 124cc lightwheight twostroke, designed after the German 98cc DKW RT100, of which the Dutch DKW importer Stokvis & Zonen (Sons) send a sample to the Royal Enfield factory, because just before the war in 1938 the Nazi government didn't provide Stokvis with new DKW motorcycles and parts because Stokvis management was Jewish. So this is why the Flying Flea is the only prewar derivative of the DKW. 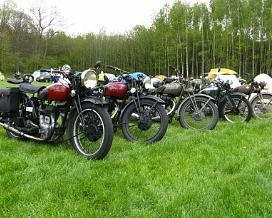 The other derivatives like BSA Bantam were all postwar. The Flying Flea was meant to be dropped by parachute behind enemy lines as a means of transport for paratroopers. The small motorcycle was closed in by a tubed cradle of which several were found in the clay near Arnhem. Postwar started with the selling off refurbished wartime motorcycles like the model WD/CO mostly in the color black and restyleded prewar bikes, now with telescope front forks, like the models G (350), J and J2 (500). In 1948 the new Bullet 350 with a full springframe came on the market and a new 500 Twin motorcycle, both a great success. The Bullet would go on with ever better performance engines until the sixties. The 500 twin evolved in time from 500cc (500 Twin, Meteor Minor), via 700 (Meteor, Constellation) to the largest British twin the 750cc Interceptor which lasted until the factory closure. During a few years in the mid fifties Royal Enfields were sold under the (American) Indian label with names like Chief, Apache, Woodsman, Fire Arrow and Trailblazer. During the 1960's Enfields answer to the Japanese twostroke attack was a 250cc twostroke Villiers twin, which was a moderate success. A great success were the OHV 250cc Crusader and Continental GT, the last one being a ready to go cafe racer, recently (2014) revived as an OHV 500cc Indian made cafe racer. Royal Enfield was a Ltd. Co. but with largely one family in management, the Smith family, it looked like a family business. Ann Bradfords book 'Royal Enfield, the story of the factory and the people who made it great' is a grand read and gives you insight in how a factory in those years from 1898 to 1970 worked. Since 1955 the Royal Enfield 350 Bullet has been made in India, first assembled from parts shipped over from the British factory, later from 1956 onwards completely manufactured in India with the old machines from the UK because they were obsolete in the UK due to a new model of frame. Engines were still made in England, assembled in India and only years later completely produced in India. While the British production stopped in the 1970's, Enfield India continued until 2014 producing almost the same 350cc engined model. From 1990 they produced even a Bullet with a 500cc engine. So up until 2014 it was not a retro bike, but an original british designed Indian made 1950's motorcycle. In 2014 came a complete new model on the market, with a entirely newly designed engine, due to European environmental legislation (i.e. noise reduction). Though still a single cylinder it has now electric start, a modern closed in gearbox, electronic ignition and electronic fuel injection, but still it has the 'classic' look and feel. Now it realy is a retro bike. In this start page you can choose for the Royal Enfield Motorcycles Photographs album, the Brough Motorcycles album, a Royal Enfield pinterest album and a pinterest album with beautiful motorcycle ads. The Royal Enfield Motorcycles Photograps album shows pictures of various models of Royal Enfield motorcycles, both British made and Indian made, mostly taken at events in the Netherlands, but also the UK, Germany and Belgium. Enfield Relations - relation between Enfield and other factories and makes. The album regarding the Brough Motorcycles has very interesting photographs taken at Wallington Hall Industrial Museum of Nottingham. These pictures are shown in a different style. The same pictures can also be viewed in the Royal Enfield Motorcycles album. 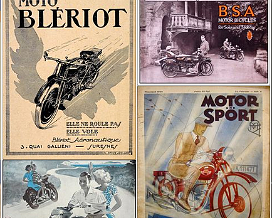 One collection of Pinterest pictures shows Royal Enfield motorcycles and another shows Beautiful Motorcycle Ads.